Bathtub, toilet, bidet, basin and mirror. All the furnishings, household appliances, crockery, beddings and house linen are in new condition (bought in 2010) and guarantee your comfort and well-being. In the Atlas Golf Resort, the houses are made of an upstairs flat (which gets the sun terrace) and a downstairs flat (with a garden). We stayed for a week in this upstairs flat at the beg. of April 2012. The compound was nearly empty, so no neighbours' noise. The flat was just like on the photos, well decorated, clean, and well-equipped. The owner was very helpful (emails) for our many questions prior to our stay. Our girls (14 + 16) used the pool only once (situated 20 meters away, walk through a communal garden behind a second row of houses) because of the poor weather (we had heavy rain every day), but it is a potentially nice pool, without sun loungers but with benches to sit on alongside it. Remember Morroco is a Muslim country, where women do not show their body - our girls had the feeling that they were a little ogled by the local gardeners. We had a rental car, which we could park just outside the flat, inside the compound (guarded at night). We felt secure, the staff was friendly. If you look on Google Earth (Atlas Golf Resort), you will see that the compound is isolated, so having a car is absolutely necessary. The Metro supermarket, a few minutes' drive away, is open non-stop every day till 10 p.m . It sells everything you might need for your stay, and sells alcohol until 8 p.m (delicious Morrocan wine 5-8 euros a bottle). We found parking in Marrakech easy and relatively cheap (The question had been: rent a car? Use taxis? ). The cleaning lady (Amina) speaks a little French, and cooks nice "Tajines" (local stews). We advise discussing with her in advance what she will charge (ingredients/work - she needs to come by taxi- etc). We used Amina's services twice, gave her 40 euros each time to give us breakfast and dinner (which in fact was prob. too much money, but we didn't know). You can eat very cheaply in town (for less than 5 euros per person). We would consider renting the flat again if we ever come back to Marrakech. It isn't much cheaper than a hotel, but you have the freedom of preparing your own meals etc. The TV has many channels in all main languages. Remember to bring a little washing powder in you intend to wash your clothes, and washing-up liquid, a cloth/sponge to wipe the table, and dishwasher tablets (we didn't use the dishwasher as we were not equipped). And in case you have young children, be aware that the chairs have white cushions, very nice but rather prone to staining. An enjoyable + comfortable stay! Nous avons passé un séjour magnifique dans cette résidence. L' appartement est très bien équippé, confortable et très calme. La piscine, située à 2 pas, est très grande. Une place de jeu juste à côté fait le bonheur des enfants.L 'appartement est situé à 20 minutes de Marrakech. Il suffit d'appeler la centrale de taxi, pour avoir un taxi dans les 5 minutes qui suivent. Trés pratique, même sans voiture. Nous n'hésiterons pas à revenir ici pour passser d'agréables vacances tout près de Marrakech. Rien a dire tout était parfait, le propriétaire ainsi que la personne sur place, sont au petit soins et disponible tout le temps, pour tout ce que l'on souhaite. La piscine ainsi que la terrasse au top,avec vu magnifique sur l'Atlas . Une place de parking pour ceux qui le souhaitent, très pratique. Résidence et appartement très propre et sécurisé. Le propriétaire a tout fait, pour que les locataires soient tranquilles. Merci également à Younes pour sa sympathie et ces très bons conseils pour un séjour réussi à Marrakech ! Appartement très bien équipé et agréable, très bon accueil et et un monsieur réactif. Je recommande!seul défaut résidence un peu retirée il est impératif d'avoir un véhicule et de ne pas tomber en panne en pleine nuit sur le chemin qui y mène car non éclairé au milieu de la campagne et chaussée en mauvais état. 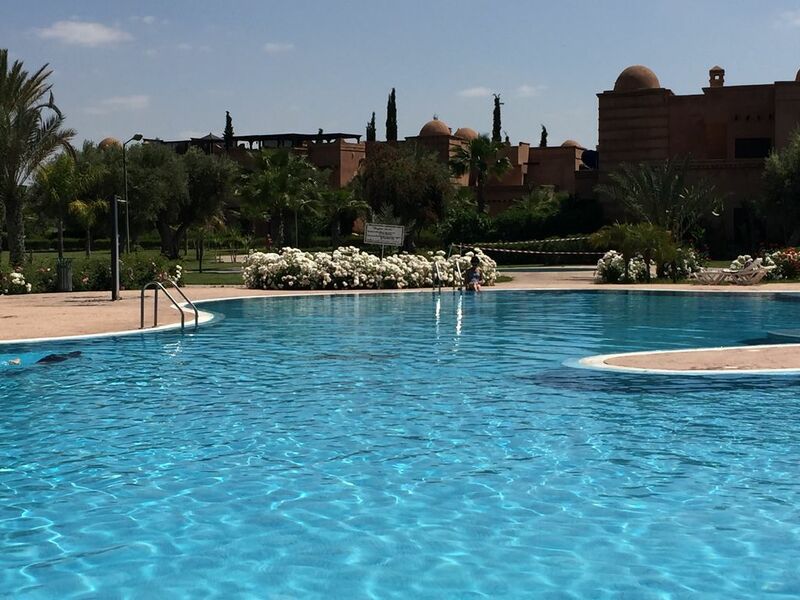 Located in the Atlas Golf Resort residence, close to the prestigious palm grove of Annakhil and only 20 minutes away from Marrakech airport, 15 minutes from Marrakech, 15 minutes away from the main tourist attractions of the city (Majorelle gardens, the Menara, the Koutoubia, Jamaa el Fna square, the Mamounia, the best restaurants, pubs and night clubs, etc. ), 1 hour from the ski station of Oukaimeden and 1 hour away from the Ourika Valley. Golf: verdant, the Atlas Golf Resort stretches around ponds dominated by hills. Magnificent course with international quality, it can be played all year round due to a remarkable maintenance of the greens and an efficient drainage of the fairways. The Atlas Golf Resort offers you a course that is ahead of the usual standards, a jewel which does justice to the most prestigious professional courses. Infinite spaces, brilliant greenery and unobstructed views over the snowy summits of the Atlas, everything that golfers wish for to spend a wonderful moment and to improve the swing they are looking for. Skiing: The Oukaimeden ski station is located a little more than an hour away from Marrakech, at 3273 metres altitude, on a mountain side culminating over the Ourika Valley (High Atlas). Oukaimeden is the highest ski stations of all of Africa and the best equipped of Morocco. The station enjoys a natural snow cover, varying from December to March and more sunshine than in the European ski stations. Once here, you can find various ski runs on a side of the mountain, with 3 surface lifts and a big chair lift. Restaurants and establishments to rent equipment are on site. Although it is relatively dangerous, there are great slopes to practise off-piste skiing, but without any assistance. It is a perfect station to spend a day skiing near the 'Red City'.